The long road leading to chocolate chips is well worth traveling. The Mayans, Aztecs, and Toltecs originally cultivated cacao trees (theobroma cacao) in Mexico before 7th century A.D.
Not only that they consumed these crudely processed cacao beans as a treasured drink, but also used them as currency. The Mayan Indians particularly worshiped these beans as their idol. Columbus introduced cacao beans to Spain in 1504. They were not really popular anywhere else until almost twenty years later when Cortez, a Spanish conquistador, planted them in Trinidad, Haiti, Fernando Po on his way back to Spain from Mexico. Chocolate chips were still far from realization, especially when western Europeans mispronounced cacao as cocoa because they thought that it was coconuts. During the 16th century, the Spanish began drinking chocolate heavily because they believed that cocoa was a panacea. They were not totally wrong, mind you. Scientists today have proven that chocolate contains theobromine, magnesium, tyrosine, phenylethylamine that affect brain chemistry. These chemicals are manipulated in treating depression. Phenylethylamine, in particular, is an antioxidant also found in red wine. It is known to prevent heart disease. Hot cocoa gradually made its way to France in 17th century through royal marriages. A love for cocoa spread widely throughout Europe, and many cocoa factories emerged during this period. In 1765, James Baker opened the first cocoa factory in the United States. While chocolate chips were still an unknown, the invention of a screw press in early 19th century started another way for people to enjoy chocolate. A Dutch chemist named Conrad van Houten invented this device. It could remove as much as 75% of cocoa butter from cacao beans. 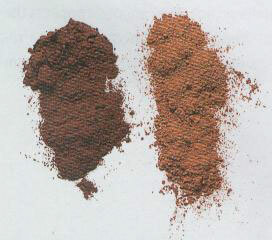 The remaining powder was brown, flaky, and very similar to modern day cocoa powder. Today, cocoa powder comes in two varieties: natural and Dutch-processed. Natural cocoa is acidic and has a strong flavor. Baking soda is usually used in the same cookie recipes to neutralize the acid. Dutch-processed cocoa has a rich, delicate flavor. It is redder, darker in color, and treated with alkali to reduce acidity. Adding cocoa butter and sugar to ground cacao beans resulted in a malleable and smooth paste that was intoxicatingly delicious. Fry and Sons distributed the first eating chocolate in England in 1847. By then, the road to chocolate chips was optimistically getting shorter. Solid milk chocolate debuted in Switzerland thirty years later. It took another eighteen years for this product to be manufactured in the United States. Finally in 1939, Nestle Foods made its greatest contribution to homemade cookies by introducing chocolate chips. This may not have happened without the well-known incidence at the Toll House Inn in Whitman, Massachusetts. Production of chocolate chips is very labor intensive. The process involves removing cacao beans from pods, then drying, fermenting, roasting them to develop flavor and reduce bitterness. They are then crushed to a thick paste known as chocolate liquor. There is about 53% fat or cocoa butter and 47% cocoa solids in this paste. This is what you and I know as unsweetened or baking chocolate. Along with cocoa powder, unsweetened chocolate is great for baking brownies. In fact, I sometimes substitute cocoa powder for unsweetened chocolate. For every ounce of unsweetened chocolate, I use 3 tablespoons of cocoa powder combined with 1 tablespoon of either vegetable shortening or butter. Bittersweet and semisweet chocolates are also interchangeable in baking homemade cookies. They each contain at least 35% chocolate liquor. Since there is no specific guideline on the amount of sugar in each, flavor and sweetness do vary from brand to brand. It is possible that bittersweet from one brand is just as sweet as semisweet from another. Bittersweet and semisweet chocolates come in blocks, bars, and chips. Chocolate chips do contain some vegetable fat that help them retain their shape when baked. So for better results, use chocolate bars or blocks in cookie recipes when they call for melting chocolate. White chocolate is basically milk chocolate without cocoa solids. It is made from sugar, cocoa butter, milk solids, natural or artificial vanilla flavoring. It is extremely sweet, very rich in fat, and easily perishable. Vanilla is its main flavor. Milk solids make both white and milk chocolate very sensitive to burning. Unless your recipes call for them, never use either one for cookie baking. Buy the smallest available package, if possible, because they both have the shortest shelf life of all. Store all chocolates away from strong odor or moisture. Keep them in a cool environment with consistent temperature. Bittersweet and semisweet have the longest shelf life, up to a year without loss of flavor. For complete facts and stories about chocolate including its role in the slave trade and its use in wartime, visit your local public library and check out this charming book, Chocolate – The Nature of Indulgence, written by Ruth Lopez and published by Harry N. Abrams, Inc. 2002. Would you also like to know what theobroma cacao means? Please visit chocolate ganache for an answer.